Simple rainwater filter with integrated dirt retention basket for installation into rainwater tanks. The dirt basket made of Stainless steel can be removed easily with the removal handle. 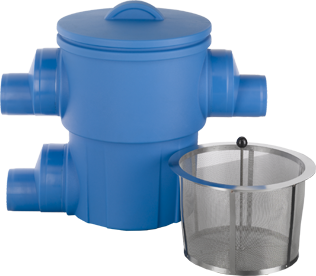 The 3P Garden Filter XL is suitable for equipments which are not only used for watering the garden. The two upper adapters DN 125 / DN 200 can be used as inlets or also optionally as an emergency overflow. The lower or lateral adapter is used as inlet to the rainwater tank. There you can also install a calmed inlet. The cleaned water can be used for toilet flushing, washing machine and for garden watering. The filter has to be cleaned depending on the contamination several times during the year. 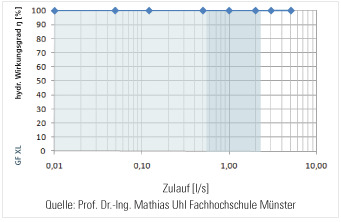 DN 125: Durchschnittliche Regenspende in Deutschland zu 80% unter 15 l/(sxha), das ergibt einen Volumenstrom von 0,58 l/s bei einer Dachfläche von 387 m². DN 200: Durchschnittliche Regenspende in Deutschland zu 80% unter 15 l/(sxha), das ergibt einen Volumenstrom von 2,02 l/s bei einer Dachfläche von 1347 m².